I designed two new Christmas crochet scrubby patterns for Red Heart and am so excited to be able to share them with you! Both patterns are available as a free download on the Red Heart website and also in Ravelry if you want to save them in your library. And don’t forget to also check out all my holiday patterns on my Free Crochet Patterns page. 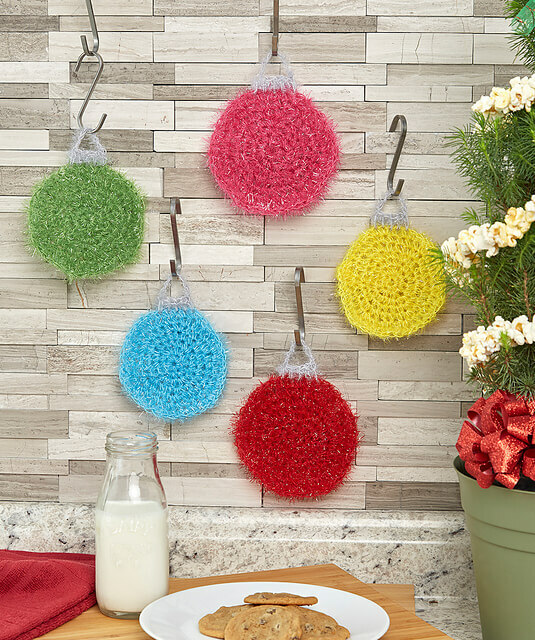 The first pattern is for these festive ornament scrubbies!! Each uses Red Heart’s Scrubby Sparkle yarn. I think these would make holiday clean up more fun and would also make a great gift set. Download this free pattern now from Red Heart. 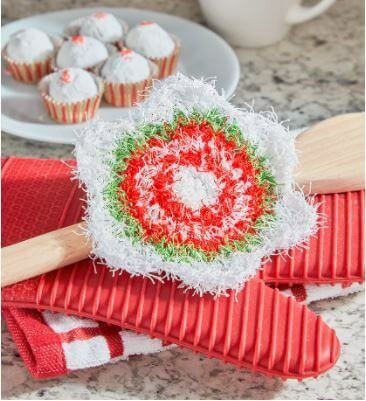 The second pattern is this holiday start scrubby. I love how you can incorporate any color theme you’d like for this and make it totally work for any season. This pattern calls for Red Heart Scrubby yarn.